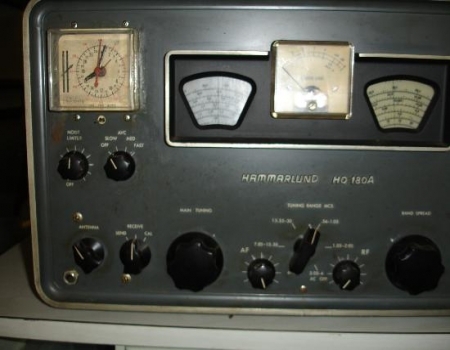 The Hammarlund HQ-180 is an 18 tube super heterodyne triple conversion(3035 Kc, 455 Kc, 60 Kc) receiver with continuous coverage from 0.54Mc to 30.0Mc. A 3035Kc crystal filter and a 1.5Kc slot filter provide good selectivity. The 3035 Kc and 455 Kc IF amplifiers provide eight tuned circuits in three stages of amplification. The 60 Kc IF amplifier contains six tuned circuits and three stages of amplification. The modes are USB, LSB, CW and AM. The tubes and their functions are as follows, a 6BZ6 = RF Amplifier, 6BE6 = 1st Mixer, 6BE6 = Converter, 6BA6 = 455 IF Amplifier, 6BE6 = Converter, 6BA6 = 60 kHz IF Amplifier, 6BA6 = 60 kHz IF Amplifier, 6BV8 = 60 kHz IF Amplifier/AVC/AM Detector, 12AU7 = SSB Product Detector, 6AL5 = Noise Limiter, 6BZ6 = Crystal Calibrator, 6C4 = HF Oscillator, 12AU7 = 60 kHz BFO/S Meter, 0A2 = Voltage Regulator, 5U4GB = Rectifier, 6AV6 = 1st AF Amplifier/AVC, 6AQ5 = AF Output and a 6BA6 as a 455 kHz Gate. Some features include a 1/4" Headphone Jack, S Meter, Fiduciary Adjust, 100 kHz Calibrator, RF Gain, Automatic Noise Limiter, Antenna Trimmer, Vernier Tune of ±3 kHz, Rear Speaker Terminals, BFO of ±2kHz tuning, Band spread, Automatic Volume Control setting of OFF/SLOW/MED/FAST, Mute Line, Flywheel Tuning, Slot Filter with ±5kHz. 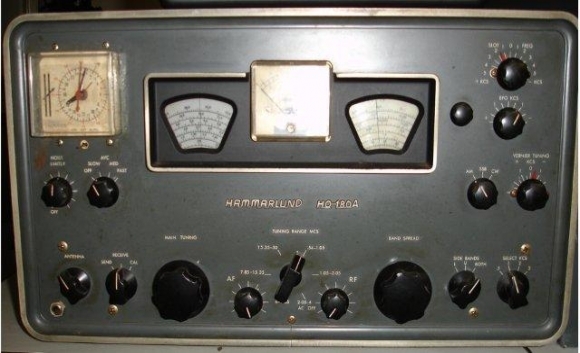 The matching speaker for the HQ-180 is the Hammarlund S-200. The radio measures 10.5" x 19.0" x 13.0" and weighs in at 45 pounds. The Model HQ-180C which has a clock. The Model HQ-180RC is the rack version with clock. The Model HQ-180XE has 11 fixed crystal positions and adds 230 volts AC. 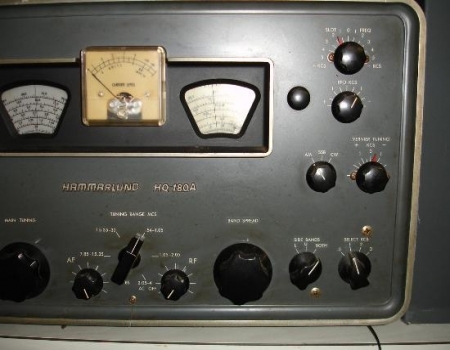 The later "A" model, HQ-180A, features a solid state power supply, 230 Volts AC, a 3 position BFO, accessory socket, has less drift and 500 ohm line output. The Model HQ-180AC has the clock timer built-in. The Model HQ-180ARC is rack and clock version. The Model HQ-180AR is a rack mounted version. The Export model HQ-180AE operates from 117 or 230 Volts AC on either 50 or 60 Hz. The Model HQ-180AX accepts 11 fixed crystals, 6 of which can be changed from the front and at a price of $625. (Note that the X models cannot have the clock). Model HQ-180AXR same but rack mounted and at a price of $675.